Multiple BOSS and Top Ten Winners! Welcome to our site! We (Harold and Sharon Marples) live in the beautiful area of the North Idaho Panhandle in Hayden Lake which is about 90 minutes from British Columbia, Canada and 40 miles east of Spokane, WA. 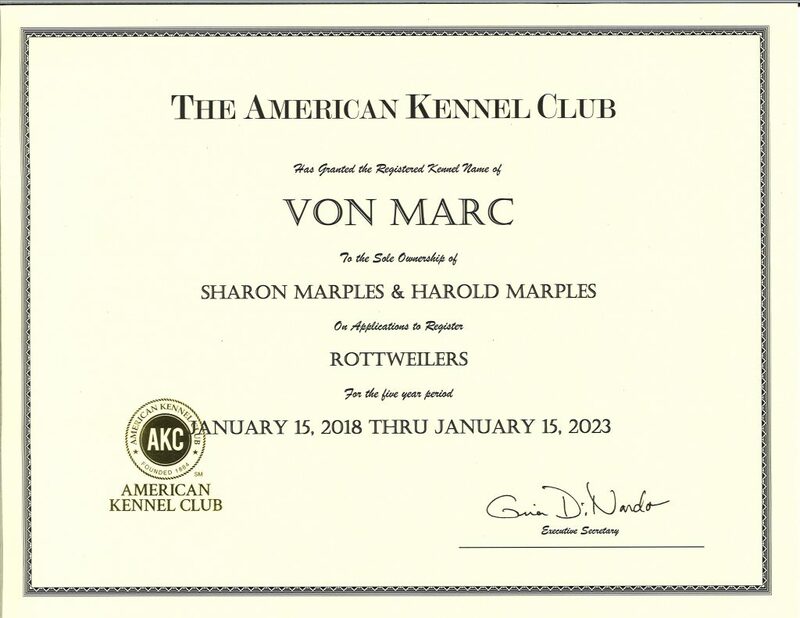 Von Marc had its beginnings back in 1985 when Harold bought me my very first Rottweiler puppy. That puppy was SP Lady Chyme von Siegerhund, CD. Chyme was instrumental in making me an advocate and lover of the breed. She was my first show dog! Chyme won the 1991 ARC National Specialty Broodbitch class and the 1990 GSRC Specialty Broodbitch class. Little did Harold know what buying that first puppy for me would lead us to! Here we are, 30+ years later, still loving, breeding, showing and mentoring for this wonderful breed. 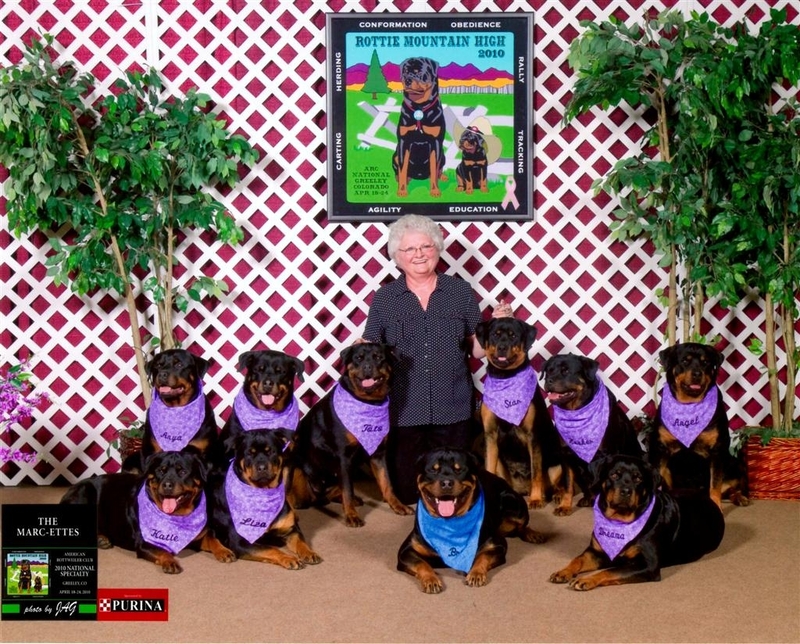 Sharon finished her second elected term on the American Rottweiler Club Board of Directors at the end of June, 2015. In 2014 Sharon also became an AKC Judge for the Rottweiler breed and is working towards adding additional breeds in the Working Group. 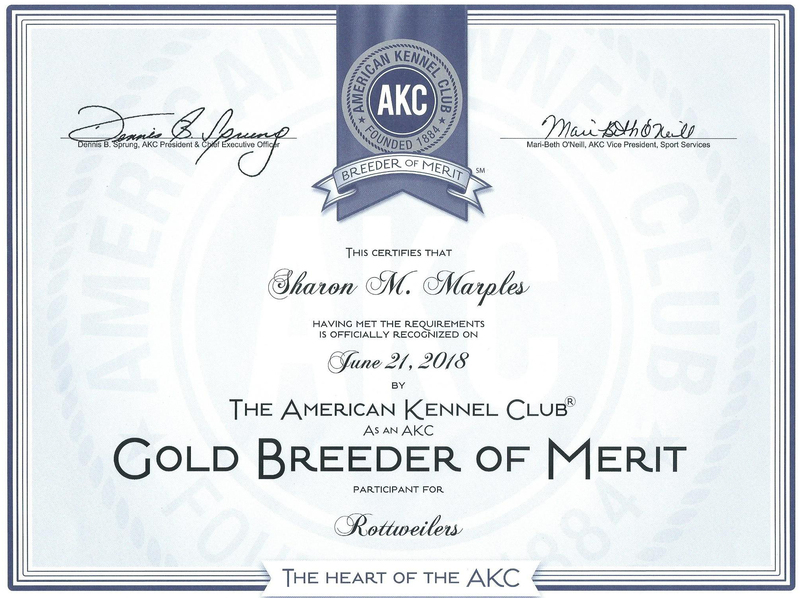 Our areas of preference revolve around conformation (AKC, CKC, UCI, UKC & Sieger shows) and the working aspects of the breed (obedience, rally, tracking, herding & agility). We are Code of Ethics breeders, belonging to the American Rottweiler Club, the Medallion Rottweiler Club, the Colonial Rottweiler Club and the Mt. Ranier Working Dog Club. 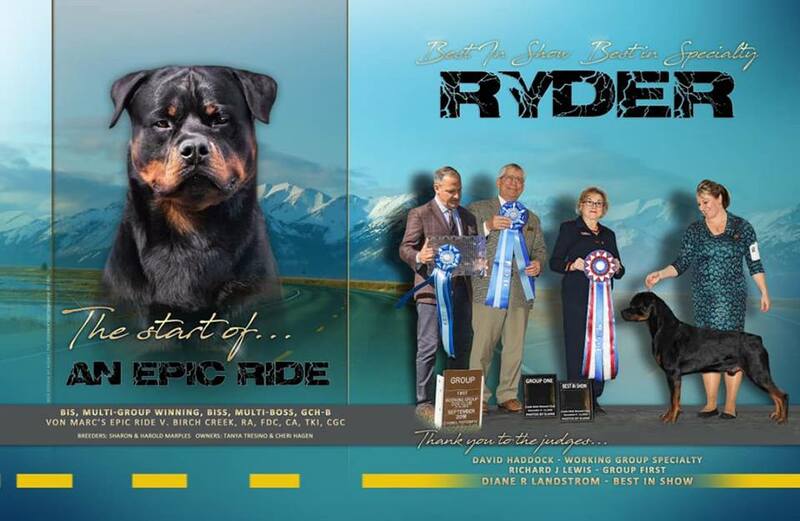 We have been blessed to have bred many dogs that have achieved Top Ten status in breed, obedience, rally and agility as well as multi High in Trial wins in obedience, herding and carting. In 2012 one of our girls earned her ARC GOLD PRODUCTION award from her one and only litter, no small feat! We have bred multi Best in Show dogs and we have bred dogs that are multiple group winners and others that are active in therapy and search & rescue. As you will note on our site, we are avid owner/handlers and encourage our puppy clients to try it themselves as well. There is nothing more fun than learning with your puppy and having that wonderful feeling of bringing home your first blue ribbon for the two of you. Our goal in breeding is the betterment of the breed while enjoying their special abilities, personalities and qualities. All puppies are sold by contract. Puppies sold as pet companions are required to be spayed or neutered. We are always available to provide support to our puppy buyers and consider all of them an extended part of our family. We are dedicated to promoting quality Rottweilers with outstanding temperament, conformation, health, working ability and soundness. 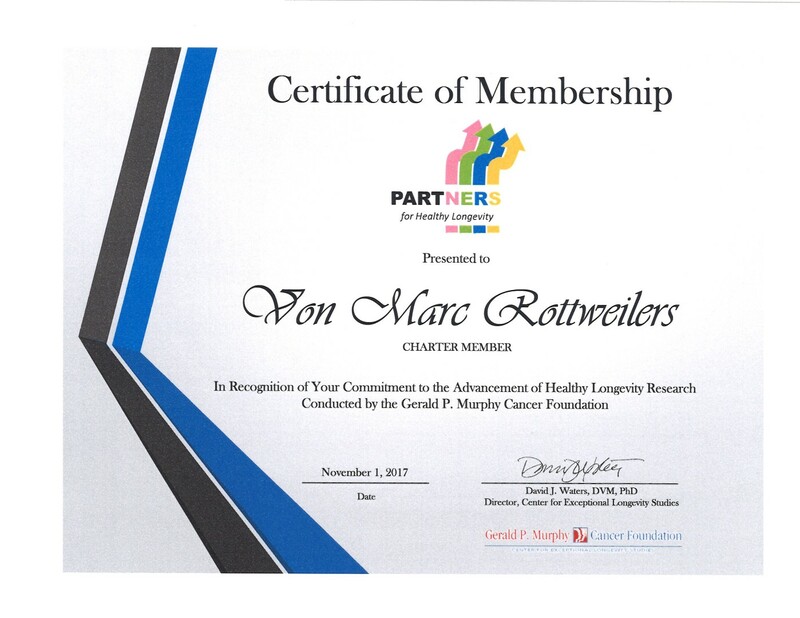 If we can provide you with information, please feel free to email (vonmarcrotts@gmail.com), call us at 208.660.0589 or visit us on Sharon’s Facebook page (Sharon Marples). 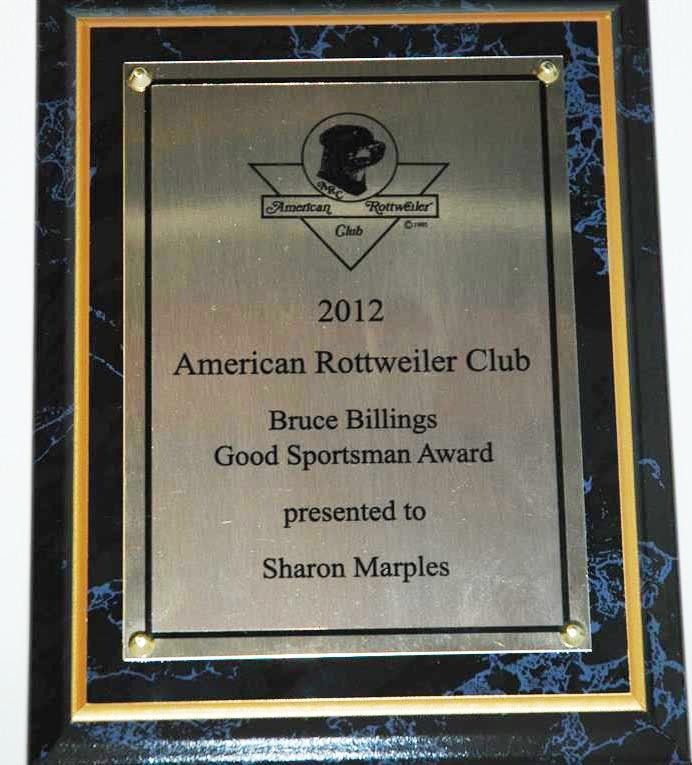 In 2012 Sharon was presented the Bruce Billings Good Sportsman Award from the American Rottweiler Club!